use source code as data for statistical analysis of software itself. 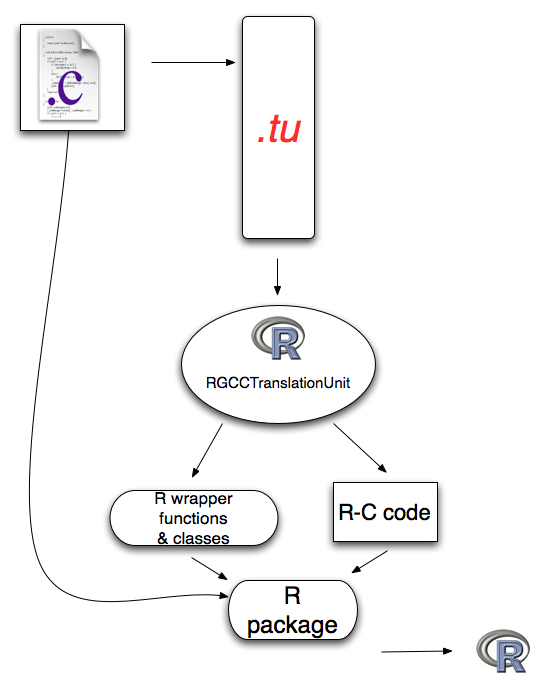 The package provides R-level functionality and classes for working with translation unit dumps from GCC of source code. One uses GCC to create a .tu file which represents the structure of the source code in a low-level format. Currently, this information is read into R using a Perl module GCC::TranslationUnit. This is accessed from within R via the RSPerl package. We have developed an almost equivalent C++ based parser that we are currently in the process of integrating into the package to remove the dependency on RSPerl. A new version of the package will be available at the beginning of July. The current version works but is in the middle of a transition to a C++ parser and the setup fits my needs rather than being a robust installation for others. However, the basics of processing the types, finding the definitions of routines, classes, methods, data structures, enumerations, etc. are working. I am adding support for generating bindings and creating registration information as useful examples of how this material can be used. I am using this specifically to generate bindings for R to the wxWidgets GUI toolkit in the RwxWidgets. Slides from a talk presented at the DSC 2007 in New Zealand. A paper based on that talk and the package. Some documents about different aspects of the package. These are "works in progress" and some are more in the spirit of notes to myself. Diagrams of the basic workflow for generating bindings and of the R commands used in the steps. The ability to process source code has been something I and others have been exploring for some time now. RSWIG is work I did last summer to add support for R to the SWIG software for generating bindings from C/C++ code to other languages such as Perl, Python, and R.
Joseph Wang has since adapted this and work is ongoing to merge the two directions. SWIG is not a compiler and so extracts information about the data structures and routines using a more heuristic parser. It is extremely good, but is not exactly the same as the compiler's view of the code. SWIG does not give us information about the bodies of the routines and so doesn't allow us to analyze the code. This is not important for those only interested in generating bindings to R or another language. It is an issue for those of us that want a tool for analyzing the code itself. The GccTranslationUnit module is a Python-based tool to read the tu files. I have thought about how to generate reflection interface from C/C++ code for some time - several years. It is not just about generating bindings, although that is certainly an important target application. It is also about doing code analysis. Want others to be able to modify the binding generation code directly from within R.
Want to be able to get "correct" results from the compiler, and not "pretty close to correct" results from a pseudo compiler/parser. Want information about the bodies of the routines/methods, and not just the signature information. This is important for code analysis, re-factoring, etc. SWIG's input language allows the user to control what she wants to have in the bindings, but it is yet another language to understand and we have one already at our disposal - R.
I started the work on the SWIG bindings for R because I feel that we can use this translation unit approach to generate input to SWIG and then leverage that mechanism to generate bindings.